Western cultures have long subscribed to the tradition that anniversaries ending in 0 or 5 deserve special mention, if not celebration. That premise goes double for the media, which has found the anniversary to be a great way to spice up a slow news day. This habit of ours seems stranger the longer you think about it, but no matter – it is what it is. At least it is so long as your anniversary is something that the culture (or its spokespersons) consider worthy of celebration or remembrance. But Mark Steyn reminded me that 1989 was one of the most consequential years in our history, or at least my history, and we’ve heard remarkably little in its second decennial anniversary. Below is a list of some of the dates that have passed this year without much mention. February 15, 1989: The Soviet Union announces it has pulled out of Afghanistan. April 21 – June 4, 1989: The Tiananmen Square protests captivate the world, until they are capped by the massacre by the Chinese military. June 4, 1989: Solidarity wins elections in Poland, serving as the first spark to the flame of freedom that will spread across Eastern Europe. 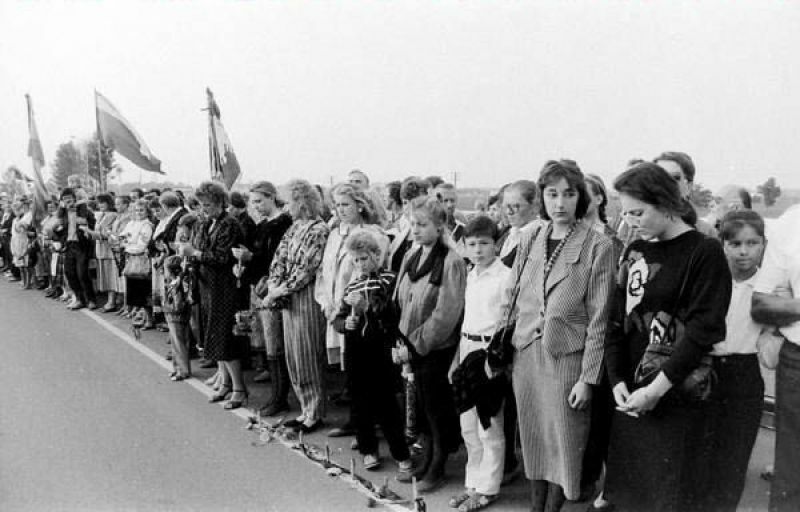 August 23, 1989: Two million Estonians, Latvians, and Lithuanians form the Baltic Way, a 600 km human chain that was the first major freedom demonstration within the Soviet Union. August 23, 1989: Hungary opens its border with Austria, creating the first chink in the Iron Curtain. September 10, 1989: Hungary opens its border and begins to receive East German refugees fleeing their Communist government. October 9, 1989: Demonstrations in Leipzig demand democratic reforms in East Germany. October 18, 1989: East German Chancellor Erick Honecker is forced to step down under pressure from the Soviets after failing to suppress anti-government protests. October 23, 1989: The Hungarian Republic is declared, ending the Communist Hungarian People’s Republic. November 9, 1989: The Berlin Wall falls, as East German officials end all travel restrictions to West Germany and ecstatic Germans dance in the streets together. November 10, 1989: The Bulgarian Communist leader is replaced by the foreign minister, who renames the party the Bulgarian Socialist Party. Communist rule in Bulgaria ends after 40 years. November 17, 1989: A peaceful student demonstration in Prague is attacked by riot police, sparking the Velvet Revolution in Czechoslovakia. Within 3 days, over half a million peaceful demonstrators will fill Prague, demanding democracy. November 28, 1989: The Communist Party of Czechoslovakia lifts restrictions on opposition parties and agrees to hold elections. December 1, 1989: The East German parliament abolishes one-party rule in the country; the East German Politburo and Chancellor Egon Krenz resign 2 days later. December 17-25, 1989: The Romanian Revolution drenches the country in blood for a week until Communist dictator Nicolae Ceausescu is arrested and executed by the military. Communist rule ends in Romania, albeit more violently than elsewhere in the East. December 28, 1989: Vaclav Havel, a leader of the Velvet Revolution, is elected president in Czechoslovakia, ending Communist rule. Consider the courage of those who stood against tyranny and brought down a Communist scourge that had dominated half of Europe for over 40 years. Consider that you, dear reader, live in the nation whose steadfast defense of the West and demands for freedom for those behind the Iron Curtain gave hope to millions. In a year when we are beset with troubles and our troops are again defending freedom against tyranny, why are we Americans not being reminded of the defeat of Communism around the world? Do you remember how dizzying those days were — when all of our assumptions about the world were obliterated by people desperate to be free? Take a moment to remember the heroes of 1989. Remind a friend to do the same. The world deserves to celebrate.